Welcome to the Woodland Public Schools Community Resource Center! 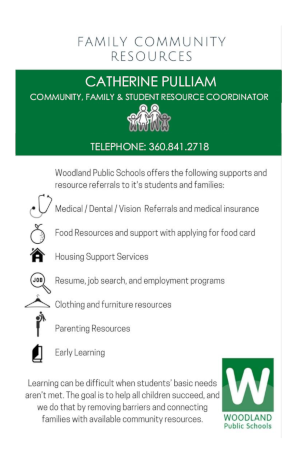 Woodland Public School's Family Community Resource Center offers information, resources and support services to students and families. The goal of this program is to decrease barriers related to student success by improving the ability of all children and families to engage fully in a positive school experience. Support can come in many different forms: anything from school supplies to health services and dental care, clothing, food, housing, job assistance, and early childhood education. We have compiled a list of resources available to our families located in both Clark and Cowlitz counties. You can access the Resource Center by clicking here or using the menu to your left. 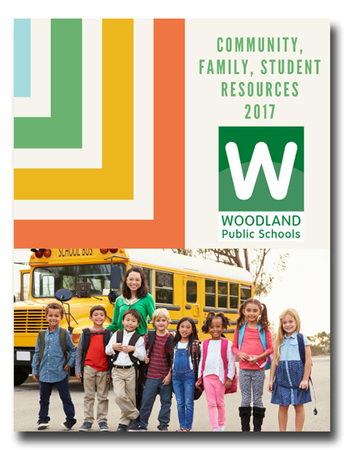 You can also download the Community, Family, Student Resources Guide for 2017 by clicking this link. Do you need medical insurance for your family? If your child does not have insurance they may qualify through Apple Health. Income limits are below. Click here to apply at Washington Health Plan Finder. If need help or support, please contact Catherine Pulliam. WHAT DO THESE RESOURCES COST? NOTHING. 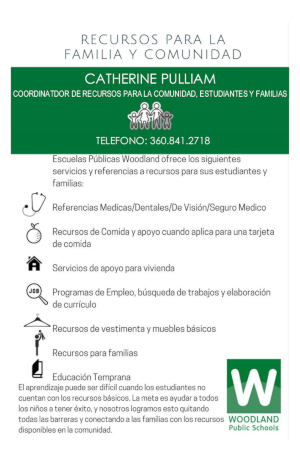 Services are free to all families in Woodland. YES!! We accept, gas cards, gift cards (Walmart, Safeway or Target) basic necessities and monetary donations. Please contact Catherine Pulliam for information on how you can help. Click here to download a PDF of our immediate needs. Open Monday through Friday from 8:00 a.m. to 4:30 p.m. If you are interested in using our facilities, we have updated our policy and procedure for facility use. We have also updated our fee schedule. Please navigate to the Facilities Use section of our website to learn more about facility usage.